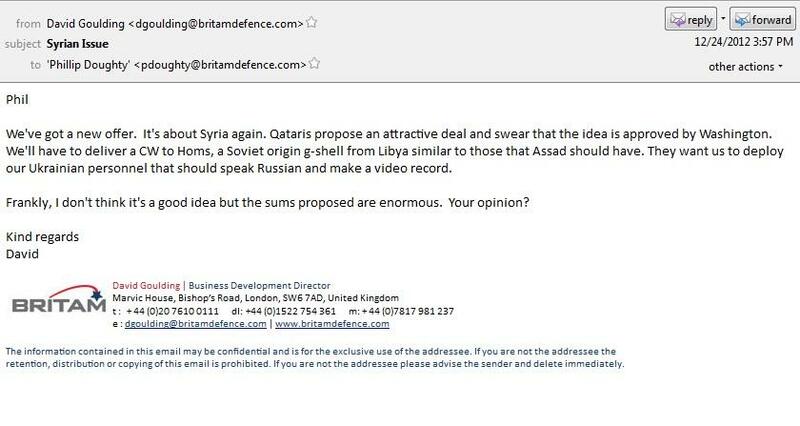 Earlier this year, a news report revealed an email in which Qatar asked Britain’s arms contractor, BRITAM to ‘transport’ chemical weapons to the Syrian town of Homs. The email was revealed after BRITAM servers were hacked and megabyted of classified internal files were released to the public. From the hacked documents, an e-mail revealed startling facts. The mail is written by Britam Defence’s Business Development Director David Goulding to Dynamic Director of the firm Phillip Doughty, who is a former SAS officer. In the mail, Goulding is seeking advice about a proposed shipment of Chemical Weapons requested by Qatari meant for Syrian city of Homs. Several conclusions can be drawn from the above mail. The demand of a Russian speaking personal could mean that ‘unknown elements’ wants to put the blame on Russia for the use of Chemical weapons. Recently, Barack Obama warned that any attempt made by Syrian President Basher al-Assad would mean a ‘red-line’, authorising US to intervene in the troubled Syrian conflict. The plotted operation, if successful would provide an ideal platform for attack on Syria. The hacked file contained the list of Ukrainian people working in Iraq, supposedly for forging videos. Several employees might not be enlisted as the folder /Iraq/People/ contained the photocopies of passports of several other Ukrainians. There are also some Serbs/Croatians and Georgians in the list who also might be filmed as ‘Russians’, quoted Voltairenet.org.